Over 70,000 sold! NOW REVISED AND EXPANDED! More than 5 million Americans live with Alzheimer’s disease or a related form of dementia. A Dignified Life, Revised and Expanded offers hope and help for the millions of family care partners who are affected by a loved one’s diagnosis. The first edition of A Dignified Life changed the way the caregiving community approached Alzheimer’s disease by showing care partners how to act as a Best Friend to the person, finding positive ways to interact even as mental abilities declined. Firmly grounded in the latest knowledge about the progression and treatment of dementia, this expanded edition offers a wealth of immediately usable tips and new problem-solving advice. It incorporates practical ideas for therapeutic activities—including the latest brain-fitness exercises—that stimulate the brain while adding structure, meaning, and context to daily routines. With new stories and examples as well as an updated resources section, A Dignified Life, Revised and Expanded gives care partners the support and advice they need to be successful and inspired in their demanding roles. Embraced by professional and family care partners throughout the United States, Europe, Asia, the Middle East, and South America, the Best Friends™ Approach succeeds because it sustains people’s connection to their world, their loved ones, and themselves. 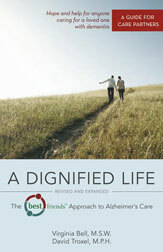 A Dignified Life: Revised and Expanded will help a new generation of care partners discover how to bring dignity, meaning, and peace of mind to their loved ones—as well as an effective antidote to the burnout and frustration that often accompanies the role of caring for a person with dementia! Now available in Kindle! Available in Kindle! Click here to download. "Supportive and practical, offering a down-to-earth, comprehensive approach for providing care." Follow these links to national groups working on prevention, treatment, and cure of dementia and Alzheimer’s Disease.